They’re known as “fat bikes,” rather than “fat tire” bikes, which was an early nickname for all mountain bikes. These bikes sport oversized balloon tires specially designed to ride on packed snow and other surfaces that run at low air pressures. So what’s it like to ride one? See this Video or in short, it’s like riding a bicycle. There’s no special technique involved. You just get on and ride and that’s what makes them fun. While they’re sometimes called “snow bikes,” they’re actually more versatile and used for all kinds of riding on snow and sand and even for winter commuting. They started riding on snow — both groomed cross-country trails and snowmobile trails. Then, they branched to frozen lakes, firm snow during spring, as well as dirt roads, singletrack, and even beaches. I borrowed the fat bike of Jug Mountain Ranch Manager, David Carey and joined Kathy and Steve on the trail system about two miles east of Lake Fork. (For directions go to jugmountainranch.com/location.) Carey welcomes the bikes on Jug Mountain’s groomed trail system and he’s experimenting with a smaller, narrower groomer that compacts some of the ranch’s singletrack trails so they can be used during winter. 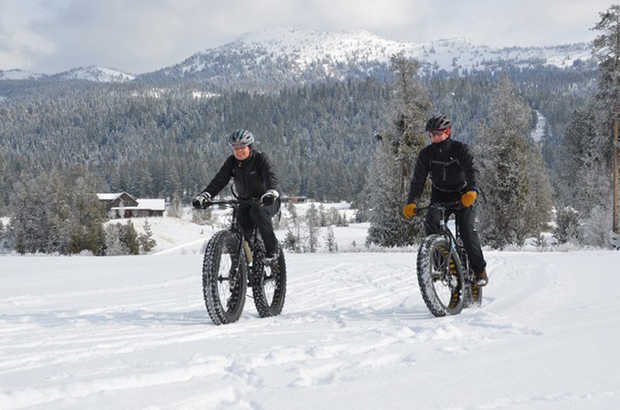 Carey sees fat bikes as another opportunity for winter recreation, a way to extend the bike riding season in the McCall area and another way for people to enjoy Jug Mountain Ranch’s trails. Interested in riding the ranch’s 15 miles of groomed trails and additional singletrack trails? When conditions allow, you can buy a $10 daily trail pass to ride. “Adding the fat bike to the overall Jug Mountain Ranch trail experience is a great fit,” Carey said. 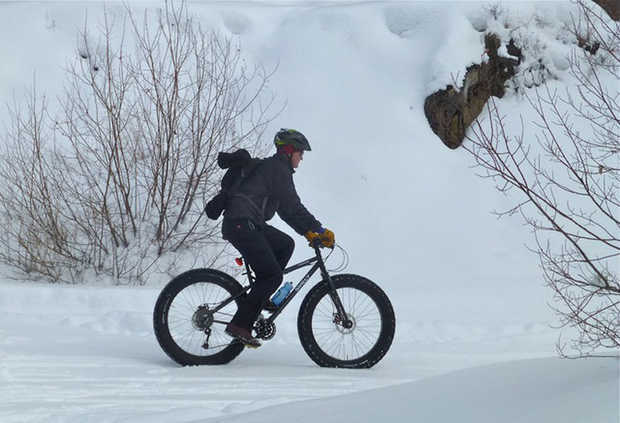 “We are firm believers that this is not a fad and can significantly increase winter trail use to a new demographic.” Carey rents his personal fat bike and plans to add more to a rental fleet this coming winter. If you go Gravity Sports, in McCall, also rents them for $35 for a half-day, $40 for a full-day and $45 for 24 hours. Bikes are available on a first-come, first-served basis. And according to Michelle Reagan, owner there: “We almost always have bikes available for people.” For other places to stay and play when visiting the area checkout the McCall Tourism Bureau. Jug Mountain Ranch and Gravity Sports hosts the Snowy 45 Fat bike Relay in early March each year and Reagan said riders are already signed up for the next event. They also host a fat bike demo day in mid-February where you can try the Surly brand fat bike. All the details haven’t been finalize as of so check jugmountainranch.com or the Ranch’s Facebook page in the coming months. 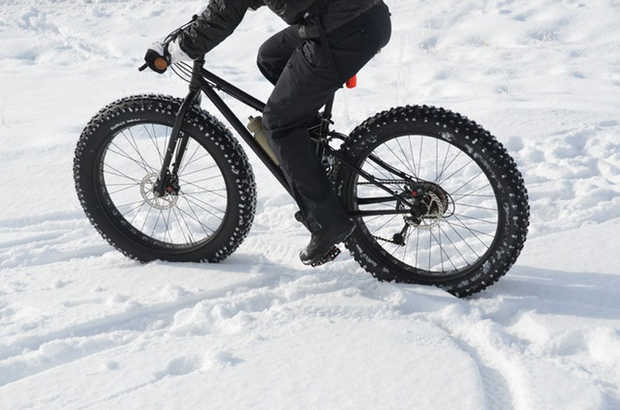 The interest in fat bikes isn’t limited to McCall and other mountain towns. Jeremy Whitman, manager of Meridian Cycles, in Boise, Idaho has five fat bikes in the shop’s rental/demo fleet along with many sales last winter. He sees fat bikes on Foothills trails and even in downtown Boise increasing. The cartoonish large tires and stocky, rigid frames make them look like throwbacks to the original mountain bikes and also something entirely different than what people are used to seeing. “On any given day, I will have five customers come in the shop just to look at a fat bike,” Whitman said. “It’s not the young, fast and fit looking for a second, third, or even fourth bike. It’s common for middle-aged rider to ride them because they’re stable, simple, durable and fairly low-maintenance bikes”. “They’re kind of built like a tank,” Kathy Muench said. The bikes were originally built for the Iditabike, an endurance race in Alaska that’s run there during the winter. “Their popularity has exploded in Alaska,” according to Dave and Sharon Sell, who split their time between Boise and Anchorage. 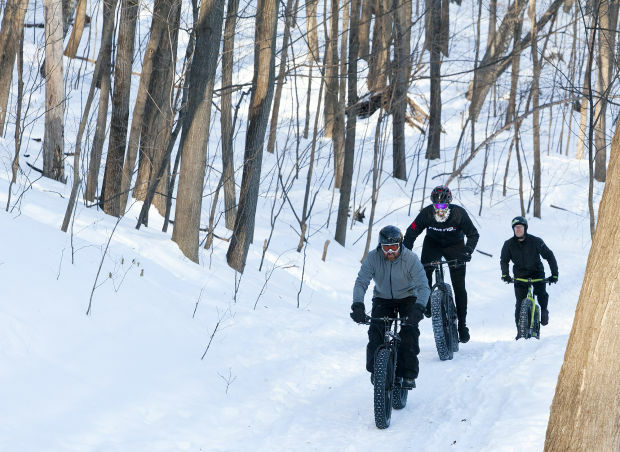 Fat bike riders are as common as Nordic skiers on the trail systems and the two sports can complement one another because most skiers prefer softer snow, while firmer conditions favor bikes. “When the skiing is bad, the snow biking is good,” Sharon says. While the sale of fat bikes has grown in Idaho and around the country it’s still a niche sport, and people are figuring out new ways to use the bikes. Like mountain biking 30 years ago, fat bikes — especially riding on snow — is fairly new to Idaho, and it will likely grow and evolve. “It’s the early stage for us, and the early stage for the sport,” Carey said. I’m no expert, but I also wanted to pass on some things I learned as a first-time fat bike rider. • Relax. It’s just a bike, and although it looks big and burly, it feels like a regular bike. It’s not as nimble as your average mountain bike, but there’s nothing about a fat bike that should intimidate you if you know how to ride a bicycle. • For your first time, go with flat pedals and warm shoes or boots. As you become more comfortable on the bike, you might switch to clip-in shoes and pedals. • Soft or fresh snow is harder to ride than groomed, hard-packed or crusty snow. Fat bikes aren’t powder machines, which is good because there are lots of other fun things to do on fresh snow. • A higher gear works better to plow through soft snow. You’re more likely to break traction in a lower gear, but you don’t want to burn yourself out in a higher gear. Find a compromise. • Stay off the front brake on the down hills. Descend slowly until you become comfortable with the traction, or lack thereof. Brake far in advance of corners, steep down hills, or obstacles. • If you’re losing traction while climbing, shift your weight toward the rear tire so it gets better grip. • Dress for exertion. Wear lighter layers than you would normally wear for cold weather. Also, breathable fabrics so you don’t get damp from sweat. Remember to factor in the wind chill when you’re going downhill. If you start feeling hot, peel a layer, especially before a prolonged climb. Then , for the descent, put it back on. • Pedal seated rather than trying to stand and grind up a steep section. You will maintain more consistent traction and balance. • Enjoy the scenery. Fat bikes go slower than your average mountain bike goes on dirt. Pedal, relax and enjoy the fact you’re riding on snow in a beautiful environment. • Not all groomed cross-country ski trails are open to fat bikes. Jug Mountain Ranch and Tamarack Resort allow them on their trails, but they’re not allowed on the Bear Basin cross country trails west of McCall, or on the trails at Ponderosa State Park, in Idaho. Check with local and state regulations in the area you plan to ride. • Do not ride on the ski tracks set by the groomer. They are needed for traditional cross-country skiers. Also, yield to skiers like you would hikers. • You can ride fat bikes on groomed snowmobile trails, but snowmobilers probably won’t expect you out there. So ride with caution. Consider using a headlight and/or red flashing rear light to make yourself more visible, especially on an overcast day. Remember, parking lots and trail grooming are paid directly by snowmobilers. You’re a guest on their trails. Please Note: Check with local and state regulations in the area you plan to ride. At this time some states do not permit fat bikes on designated snowmobile trails. • The International Mountain Bike Association has some good information and guidelines for riding on snow. Go to: imba.com/resources/land-protection/fat-bikes. Editors Note: If you have a favorite place and a few photos where you have fat biked, please share with us at HaveFunBiking.com. 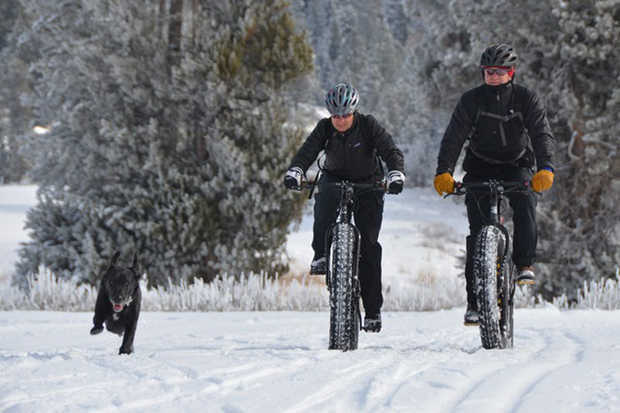 This entry was posted in Destinations, News and tagged Fat bikes, Fat bikes in Idaho, Fat tire bikes, Fat tire riding tips on November 23, 2014 by Russ Lowthian.